Thank you, St. Martin’s Press. This book made me question wanting children. That’s how scary Hanna was. The blurb says: “Meet Hanna.” After reading this, I say, “Hm, no, thank you.” You can keep that girl away from me. There’ll be no complaints. 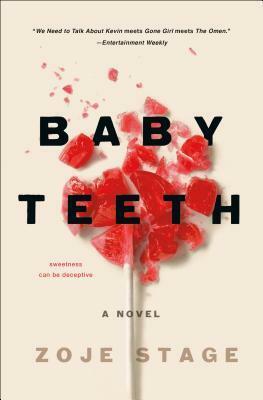 Told in dual POV, Baby Teeth is the kind of creepy story that is fun to read. At least it was for me. I practically read it in one sitting, and the story held my attention from start to finish. I blame that on the great writing style (even though I’m not the biggest fan of third person, this one was well-written and engaging) and on the intriguing characters. I had doubts about Hanna’s POV at first, but it surprisingly didn’t annoy me. I couldn’t imagine being inside the head of a kid could be so entertainingly creepy. Her thoughts were logical and nonsensical at the same time. Sure I felt she was a little too smart for someone her age every now and then, but it could be explained by her psychopathic tendencies, if I can call it that. I won’t call Hanna a psychopath, because I believe that’s not a diagnosis you can have until a person’s brain is fully developed, but that’s an idea of what you can expect from Hanna. She’s manipulative, violent, intelligent, shows a lack of empathy and attachment to anyone else but her father, and she’s scary AF. Imagine being her mom and having to live with a kid who not only shows those traits, but wants you dead. That’s Suzatte’s life. Poor woman went through a lot in this story. Unlike Hanna, I found Suzette to be an extremely likable character. There were times I wanted to shake her because she gave her scary daughter too much power, but I couldn’t imagine being in her shoes, so I tried to cut her some slack. I loved that, despite everything going on, she still tried to be a good mother. She could’ve easily tried to be as awful as her daughter, but even when she tried to fight back, I felt it was more out of self-preservation and worry than being mean-spirited. In all honesty, she had more patience than I expected myself to in a situation like that. The plot wasn’t perfect--some of the conflicts could’ve been avoided had Suzette acted like a person with full access to technology a little more--but it sure was engaging. I was eager to learn what awful thing Hanna would do next, and I was cheering for Suzette the entire time. I wasn’t the biggest fan of the ending, but I didn’t hate it, either. I guess it fit well the creepy factor present throughout the book. Overall, this was a highly entertaining read from a debut author that shows promise.